The Empath mixer combines the vision of Grandmaster Flash and Rane technology. Compact size, exceptional performance and advanced features set the Empath mixer apart. 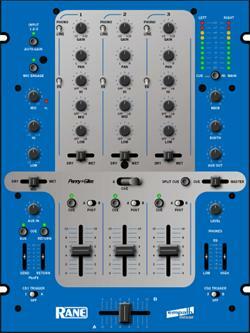 The Empath is the most able 3-channel, 10" format mixer available. The name implies: understanding, awareness and sensitivity to the needs of DJs. When traveling, finding power supply adapters is difficult. A universal, 100 to 240 VAC, 50/60 Hz internal power supply allows using the mixer anywhere in the world. Auto-Gain prevents performance-wrecking swings in program level when changing sources. The music is never too soft or clipped. The FlexFX external effects loop with individual Dry/Wet pan controls for Mic, Input Channels 1, 2 and 3, provides versatility for the most demanding mixing styles. Smooth, accurate and reliable mixing is made possible by employing the most respected name in audio faders. Penny & Giles faders are simply the best money can buy. Cue selection for a three-channel mixer can be slow and complicated. Flash-Cue allows the DJ to rapidly select Crossfader A-Cue-sum or Crossfader B-Cue-sum with the flick of a switch. Nothing is more frustrating than arriving at a club and finding their jacks don't match. Systems may have XLR, TRS or RCA connectors. The Empath provides all three. Two-band headphone tone controls allow the DJ to match their mixer to their headphones. More headphones are compatible with the Empath. It provides both 1/8" and ¼" headphone jacks, which may be used simultaneously. Two assignable CD triggers work with any CD player with fader start ability. The Accelerated-Slope, full-cut, 3-band tone controls are the most flexible and highest quality available. Crossfader assign switches for each Input Channel allow any program to be mixed on the A-side, B-side or Post crossfader.